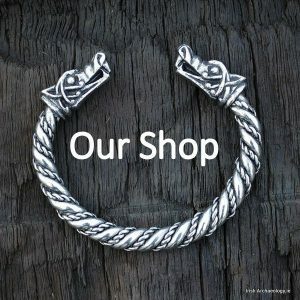 I suggested to Colm that it was about time he got a logo for his website – this website, irisharchaeology.ie. OK then, he told me, (charitably), you can sort it. OK then, I told him, I will. But where to start? 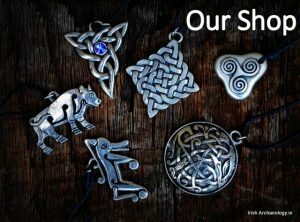 The entire discipline of archaeology in Ireland is rich with beautiful, iconic imagery and symbolic motifs. Come back with something spiral, Colm had instructed me. I immediately said NO to that: too obvious! I took out all of our archaeology art books and explored countless geometric, animal and human form motifs. I doodled. Colm didn’t like any of my designs. Our 5-year-old daughter joined in the design process. Colm mused over her offerings. But politely declined. Something spiral, they told me. I raised an eyebrow – had Colm been having words in their ears?? But he hadn’t. Maybe if the idea of a motif like that was ‘obvious’, it was so for a reason. My friend Johnny Ryan (Pointillisim), who is both artist and archaeologist, told me to get some ideas sketched down and to send them on to him. I sat down to scribble “something spiral”. 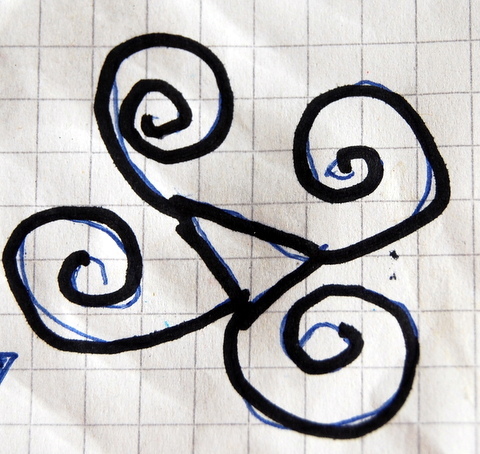 I drew a simple whirl with a dot at the end. Colm looked at it. Why the dot? he asked. I don’t know, I said, I must have seen a spiral with a dot like that somewhere. I took out my copy of Megalithic Art in Ireland by Muiris O’Sullivan, and there it was, right on the frontispiece page: a simple spiral, with a dot at the end, found at Knowth, in the Boyne Valley Neolithic passage tomb complex at County Meath. The motif had been picked onto the side of the stone basin found in the right recess in the eastern passage and chamber inside the mound. The stone basin is one of more than 300 stones at Knowth which had been lavishly decorated with the distinctive motifs of megalithic art – mysterious concentric circles, dots, spirals, triangles, arcs, rays, wavy lines and grid marks, picked or pecked onto the rock surface using a chisel or a punch stone tool. 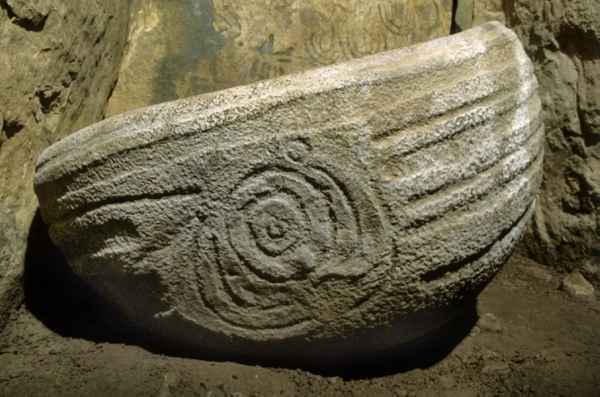 It has been suggested that the spiral motifs could have celestial meanings, or in some incidences, could represent eyes – or that they are the result of states of altered consciousness, associated with the ritualistic function of the Knowth monument. I snapped a photograph of the Deborah Gamble sketch and emailed it to Johnny. 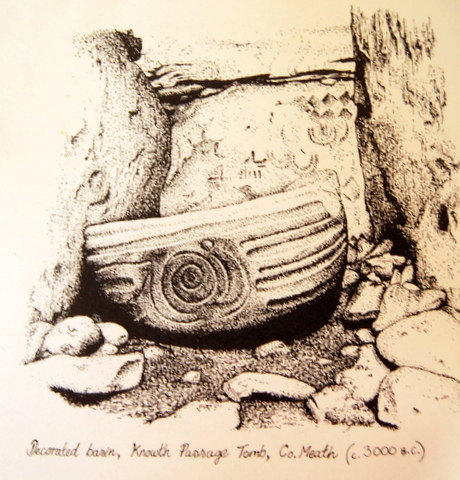 Somewhat adding to the mystery in the topic of megalithic art, I noticed in photographs I looked at of the stone basin that the motif is more clearly a series of concentric circles, and not a spiral at all – but the drawing by Deborah Gamble seems to have picked up an unmistakable spiral in the relief carving. It was this curious arising spiral which was to the basis for Johnny’s design. After a few more emails, phonecalls, and a visit to Johnny at work at his desk, he came back with the motif in the image at the top of this post. Irish Archaeology had got its logo. …yes I agree Aiden..it does make far more sense now that I have read what went into the making of the logo..Bless and Thank-you..
Just read the story of how your logo came about. I found it interesting. Love the design. Also tell Aoife I thought hers was great too!